Surrounded by pines, oleanders, rosemary's and Mediterranean bush, Villa Montecristo sits in the south west coast of the Island, at 50mt from the sea, near the beautiful beaches of Seccheto (3 minutes on foot - it's just 150 mt), Cavoli (5 minutes on foot) Fetovaia (five minutes by car). Villa Montecristo sits along the main road: this ideal location, so close to the beach and the village nearby, entails that - mostly during peak season - there is car passage especially when people go to and come back from the sea. Villa Montecristo is an ancient charming Tuscan house with a spectacular sea view overlooking the isles of Montecristo and Pianosa, the bay of Seccheto and the ridge of Fetovaia. 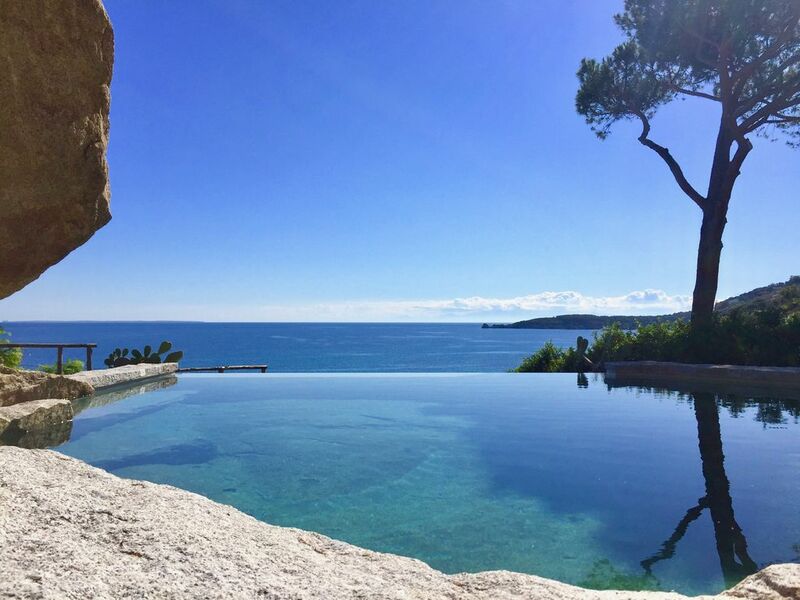 Since 2017 Villa Montecristo offers a unique and stunning pool carved out in a ancient granite quarry, entirely made of stone: its infinity edge makes you feel like you are swimming in the open sea while you are swimming in the pool! The Villa is lavishly furnished with antiques, paintings and prints; it is characterized by a wide beamed ceiling drawing room with granite stairs and wood gallery. The spacious garden has tree shaded and sunny areas; there is also a thatch covered terrace ideal for eating outside. The rooms have tiled floors and are spacious and furnished with 19th century antiques. Both the living room and the kitchen have doors leading into the garden. During spring and summer we have two showers in the garden (cold water only) perfect for cooling after a long day on the beach! The nearest village is Seccheto, to be reached in less than 5 minutes on foot. For further information and photos don't hesitate to contact us! Villa Montecristo belongs to my mother's family (the Mellini's, an acient roman nobiliar family) since XVIII century: it is a charming tuscan villa and it is furnished with ancient furniture. In 1814 Emperor Napoleone Bonaparte spent few nights there, in the double room at the ground floor (that so we call 'Napoleon's room'), and he left two iron camp beds that we converted in two tables in the sitting room. In the whole house you can feel Napoleon, as my great grand father, my grand father were (and my father is) Napoleon's heirlooms collectors. By the way, even if the house has an ancient history and a glorious past (if only it could speak I am quite sure it would have many things to tell…) it also has a present! The Villa sits about 50 meters from the sea: at just three minutes on foot there is Seccheto’s beach, and Seccheto village (and its shops) is less than five minutes walking; Cavoli’s beach, known as the most beautiful beach on the island, is less than ten minutes on foot, so you can have ready at hand almost everything you need! The Villa and its garden are big enough for many people, so everyone can find his own quite spot to read a book, to sleep, to work, to have a glass of wine by watching the sunset on the sea in Fetovaia’s bay. But there’s also a terrace area with two long garden tables where we use to have lunch and dinner all together, eating Italian typical meals we cooked in the afternoon with fresh organic food or, why not?, to enjoy a great barbecue! In 2014 we renovated a garden belt behind the house with a granitic table and a bench for solitary people that want to be alone with theirself to work or to meditate in a peaceful spot. In July 2017 we made perhaps the biggest improvement ever: a spectacular and unique infinity swimming pool entirely built in the antique Roman granite quarry behind the house, to be published shortly in the major architectural magazines. The Property has four bathrooms. The main villa has two bathrooms with shower/bathtubs and one bathroom with shower. The dependance has one bathroom with bathtub. Linen are rented from a professional laundry at a cost of euros 13 per person/per week. Linen set includes: bed sheet, flat top sheet, pillowsleep and three sizes bath towels. Brand-new Bosch washing machine, german quality. 7 kg capacity. The property can host up to three cars: one in our private parking just outside the gate and two in the garden. Free Wi-fi hi-speed connection at your disposal (average speed: 18 Mbps download). Bath towels included in the optional linen cost. Kitchen towels are provided for free. Beach towels are not available. The huge (100 sq mt) charming living room is the heart of the Villa. It can accomodate up to 10 people and a brand new LCD tv is at your disposal. The brand new dishwasher, german quality, offers different washing programs with energy and water saving. A brand new side by side steel refrigerator very beautiful, with high storage and high food preservation performance. We recently renovated the cooking area in the kitchen: we restored the beautiful ancient wood stove and put brand new big electric oven (90 cm lenght, 78 lt capacity) for a top cooking performance. There are enough dishes/glasses, utensils etc for 17 people. We love cooking, so in the kitchen you'll find many kitchen utensils as blender, grinder, electric whisk etc. Hi-fi stereo with cd player and radio. JBL docking station for iPod, iPhone and other mobile devices (lighting connector for iPhone 5 and later, bluetooth an jack cable connection modes). There are many books at Villa Montecristo: all of them can be read but, as they are all catalogued, please don't bring them back home with you! The big patio, covered with canework, is the heart of Villa Montecristo during good weather. There are two big tables that can accomodate up to 17 people and four wood sun beds. If you want to celebrate a special occasion or simply taste a typical tuscan meal, we can organise a catering service at Villa Montecristo from one of the best restaurant of the Island. We'll be glad to give you more information! Una bellissima vacanza primaverile a villa Montecristo: casa meravigliosa, natura incontaminata, padroni di casa disponibili e gentili. Torneremo senz'altro! Grazie, Carlo! Siamo felici che siate stati bene e speriamo che torniate presto a trovarci! We - a group of old time friends with children - spent a week at Villa Montecristo in February. Even if the island is well known for its summer side, it has been a wonderful holiday and we had the chance to go all over the island with nobody around: desert beaches, beautiful landscapes... the only sound we heard from the house was the waves crushing on the beach and the birds singing on the trees. Despite the winter season, the weather in Secchetto was hot enough to chill all day long in the beautiful garden or to relax on the beach (which is about 1 minute away). In the late afternoon we enjoyed cooking in the big, charming kitchen: being a group of food enthusiasts, we appreciated very much it was fully and very well equipped with high quality appliances which were impossible to be found in our past experiences in rented houses. Among blender, grinder, whisking, we felt in love with the entire set of aluminium pots, which are a real must for every chef to get excellent results! The house itself is very beautiful and charming, everybody has his own space to be alone but the stunning and huge sitting room was the heart, where we all spent time together. thank you for such a great review! We are happy you enjoyed your stay with us and you found our pots "a must" for you as a chef. We look forward to hosting you again to show you also the "summer side" of Elba! Perfect family and friends getaway... even in winter! We’ve been in this house for the fourth time this year. Thank you so very much for a wonderful holiday again. We didnt know what to expect about the new pool and we are more than exited about it now - it fits so well in the sorrounding and it‘s really beautiful up there with the stunning view. Before that, it was a great house closed to the beach - now it’s a great house really just by the sea. We also noticed some other new things (new matraces and chaires in the living room!). Thank you to Fiametta and Family for caring so much and sharing this place! We will come back in two years. we are very honored for being your host for the fourth time and we look forward to guesting you for your fifth! Thank you for choosing Villa Montecristo as your second home on Elba, can't wait to show you new improvements we're planning for the next seasons! È stata una vacanza stupenda. Sechetto è un ottimo posto per essere fuori dalla confusione anche in pieno agosto ma comunque avere tutti i servizi minimi per godere la propria vacanza: mini market, panificio, pizzeria, spiaggia attrezzata. La casa è molto bella e si presta ottimamente per famiglie o gruppi numerosi. Noi eravamo in 8 con 5 bimbi..surplus gradito la stupenda piscina da cui ammirare il cielo stellato nelle calde serate elbane! Final cleanings, water, electricity, heating and, if needed, linen expenses are not included in the weekly rate and will be settled on arrival /departure. For private events, the security deposit is € 1000,00 instead of € 500,00. Cancellation policy applied as per attached rental agreement.